H1MT, Accelerated H1CL, retaking Higher Mother Tongue O’s?! Just as you thought you had seen the last of Mother Tongue, you are now overwhelmed by several options. We are sure Ms Chen, our friendly Dean of Systems, has briefed you extensively on statistical matters like the probability of a marked improvement in your O-level grade by retaking. Here, we look into each option and interview the seniors who have “been there, done that” for their personal experience. For those on the other end of the spectrum, you will have to spend four blocks a week holed up in lessons while the rest of your batchmates have the time to themselves. It is a fair amount of time and can be taxing when the two-block lessons are held in the late afternoon after a full day of lessons. The other two one-block lessons may also be scheduled at the end of the day. Students who have gone through it may tell you it is a miserable waste of time but ultimately, it is tolerable when you are blessed with a fun class and incredibly nice teachers as it was for Jessie Lim (13S05B). Even though she could have opted not to take Chinese again, she did so anyway as she knew she could have done better. Also, Chinese lessons are not very intense and serious when most of your classmates also share in your linguistic struggles. Dominic Teo (13A01D) even said that “Chinese was the most exciting part of my life”. Grade prospects are not dire either, with the large majority improving at the very least. There are even D7 to A cases! Open only to those who scored a B3 in Chinese, the four-block-a-week lessons are now halved. On the account of having managed a B3 in Higher Chinese, students are expected to have a respectable standard of Chinese already. This means condensed lessons with the same amount of practice papers as those taking the normal H1CL. As the format of the A-level H1CL paper is shorter and less demanding than the HCL paper, albeit with Listening Comprehension and Orals, these two hours every week may not be that great of a sacrifice for the A grade. Firstly, if you have an A2 there is no reason for you to go through the O-level paper again for an A1. Ms Chen told us the story of how the A level top scorer of 2010 was a River Valley student as RI(JC)’s top scorers had gotten an A2 instead of A1. And in light of that, some A2 students have actually taken the retest in the hopes of an A1. The H1CL format differs from the HCL format slightly with Listening Comprehension and Orals components held in July/August. There is no more 公函 (gonghan/letter writing) or 报章报道 (baozhang baodao/newspaper article reflections) in Paper 1, instead there are four different essay formats to choose from, the most popular choice of which is the scenario-based narrative. Paper 2 also has its own set of differences, but rest assured you have not seen the last of the 综合填空 (cloze passage). Also, a D7 translates to a Sub-pass grade for the A-level grading system, which is technically a fail grade. Still, this meets the minimum requirement for entering local universities. However, for the Raffles Diploma, our own version of CCA records and more, this falls short of the basic Cognitive requirements. This means you will have to continue studying Mother Tongue for the next year. There is the possibility of waiving the RD of course. If you strongly feel that there is no need for you to retake Chinese at the expense of the RD certificate, then go on ahead. 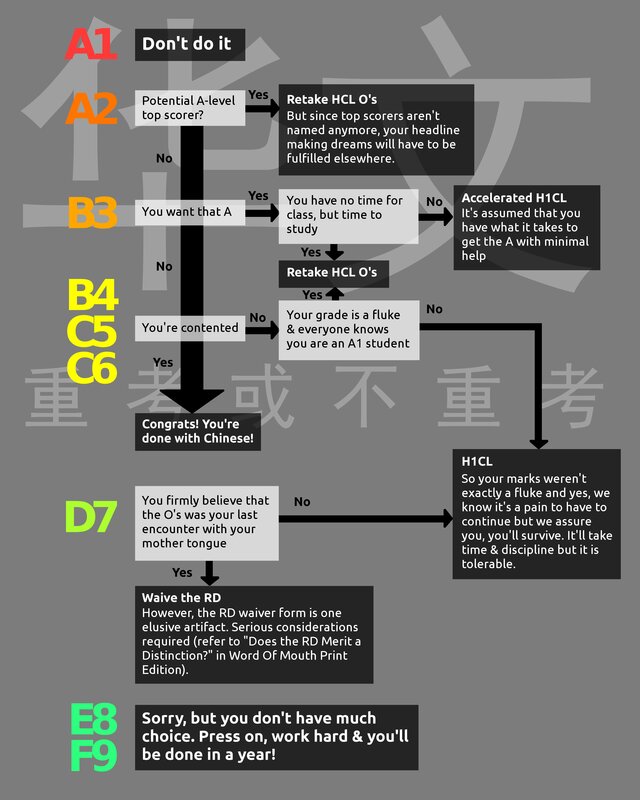 For easy reference, we have crafted a flowchart for Chinese-taking students still mulling over their choices. We hope that this has helped you better understand your options and may you pick what is best suited for you.